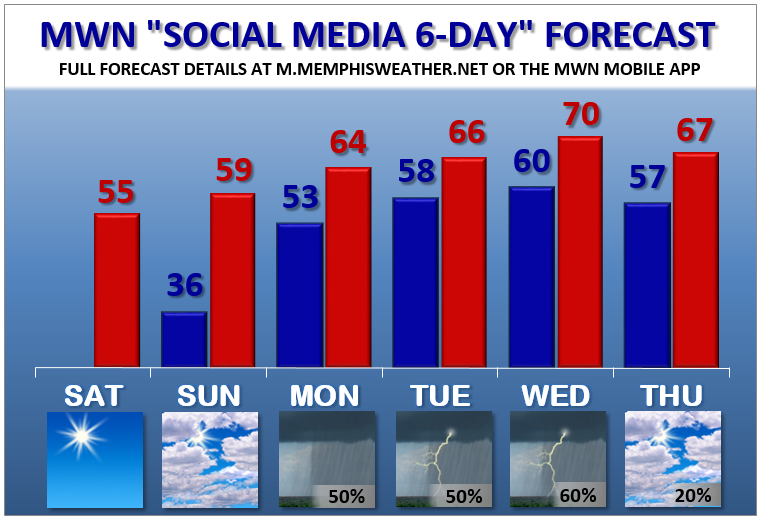 If Mid-South weather could set it's "status" for this weekend, it would be "It's Complicated." Metro temps as of 2:30pm Sunday, in the wake of a cold front that sits along the MS/TN state line. 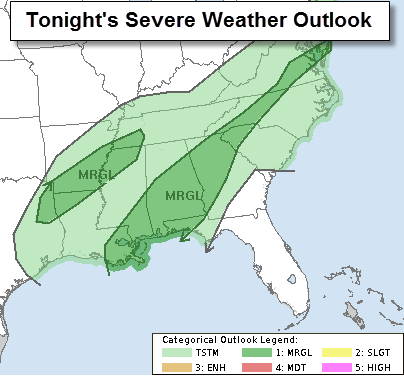 As the Mid-South returns to the warmer airmass overnight, it will set the stage for one more chance of severe storms as the potent spring-ending cold front arrives from the west. Showers and a few thunderstorms are expected to be scattered as the front retreats back to the north this evening, then as we near dawn Monday, the front pushes a squall line into the region from AR. The squall line will be moving into an area that is favorable for strong thunderstorms, a few of which could be rotating. Damaging wind along the line will be the most likely severe weather threat, along with very heavy rainfall and a chance of flash flooding, but a couple of tornadoes will be possible, mainly south and west of the metro in the wee hours Monday. The most likely timing for the squall line to pass through the metro is between 4am-9am Monday with a few strong storms also possible ahead of the line, after about 3am. A Flash Flood Watch is in effect for widespread 2-5" rainfall amounts from Sunday afternoon through Monday at noon. 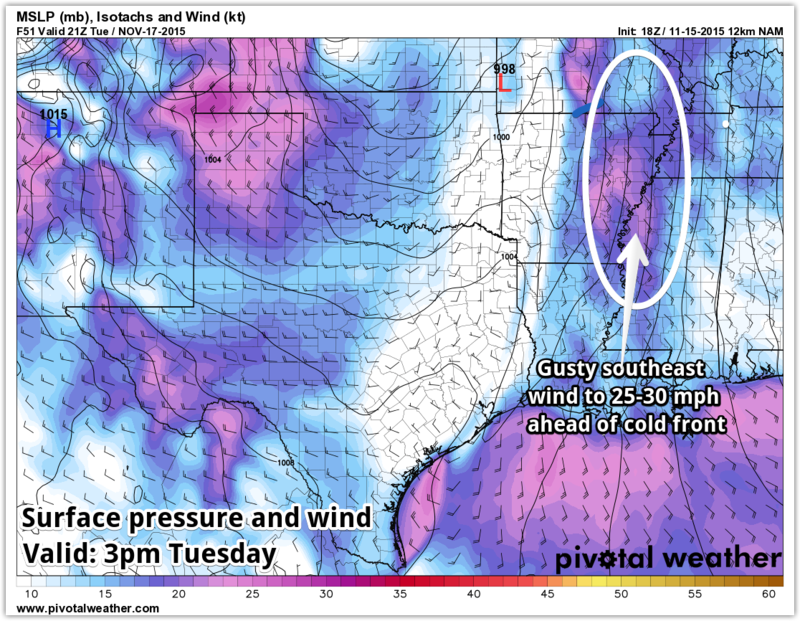 Low pressure over the southern Plains will drag a cold front into the Mid-South early Monday, as a second cold front retreats just to our north overnight, placing the Mid-South in the warm sector one last time overnight. Map above valid at midnight. Simulated radar from the HRRR model shows a squall line of storms advancing on the Mid-South overnight from AR and LA as snow and ice wrap around low pressure over the Southern Plains. Loop ends at 4am, just before the line moves through the metro. Graphic courtesy WxBell. Model data - timing may not be exact. Behind the line, low pressure to our northwest and strong high pressure over the southeast U.S. will set up a scenario for very gusty wind throughout the day Monday. Southwest wind to 30-40 mph will be possible, resulting in the issuance of a Wind Advisory for the metro through 6pm Monday. 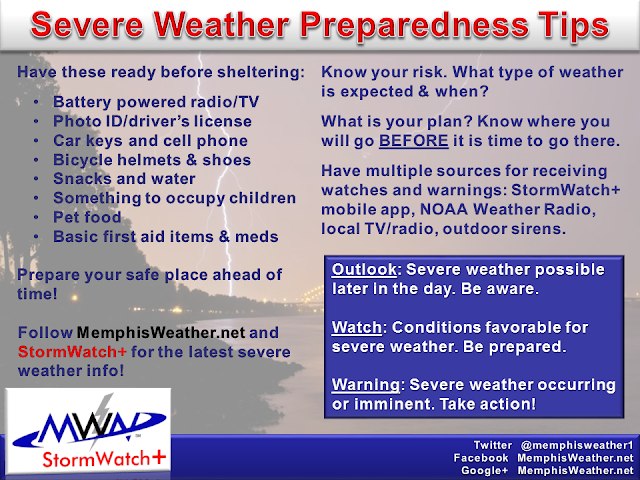 All metro residents are encouraged to tie down or bring in any outdoor items that could blow away. Wind will diminish Monday evening to 10-15 mph. 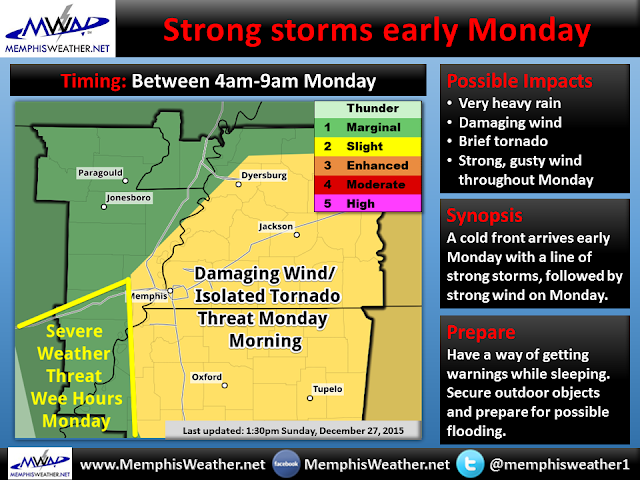 To recap, scattered showers and storms are expected most anytime through the wee hours Monday morning. The severe weather threat begins after about 3am Monday and is most likely with a squall line of storms that should be over the metro between 4am-9am Monday. Damaging wind, small hail, and an isolated tornado (mainly southwest of the metro) is possible. Flash flooding is also possible due to very heavy rainfall and strong gusty southwest wind will continue throughout Monday. Once the system exits Monday, temperatures drop to much more seasonal levels with highs in the low 50s and lows in the 40s Tuesday and Wednesday, before dropping even further as we head towards New Year's Eve and the start of 2016. 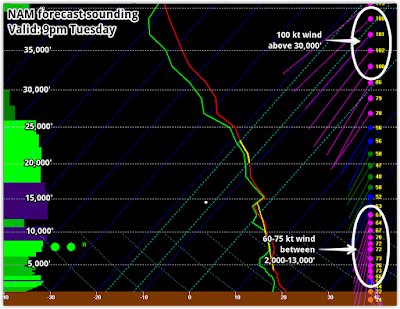 A chance of showers exists ahead of the reinforcing push of cold air on Tuesday night and Wednesday. 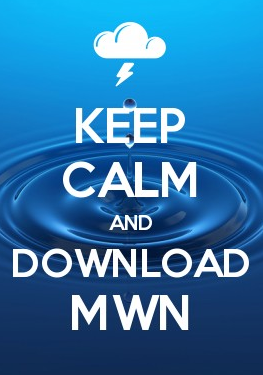 Reference the MWN Forecast in our mobile app or at the links below for those details. We'll have any additional updates on our social media channels the next 24 hours. 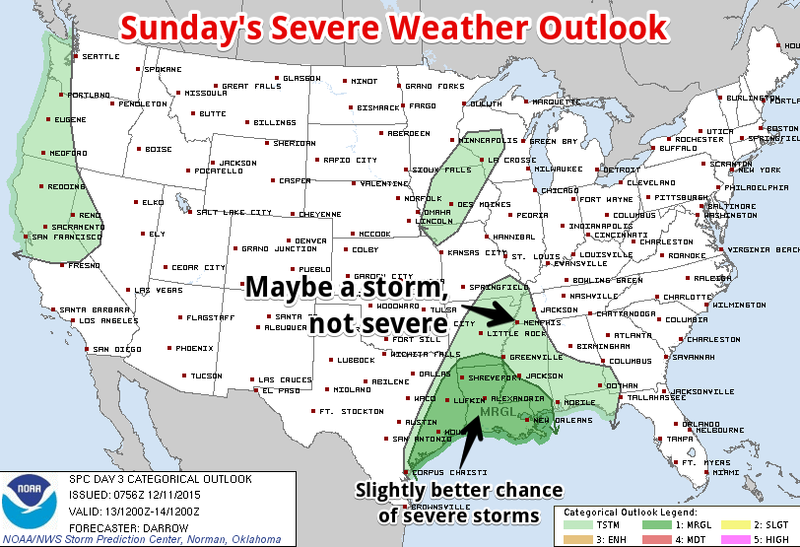 After yesterday, severe weather is now in the rear-view mirror... right? Wow, what a day. 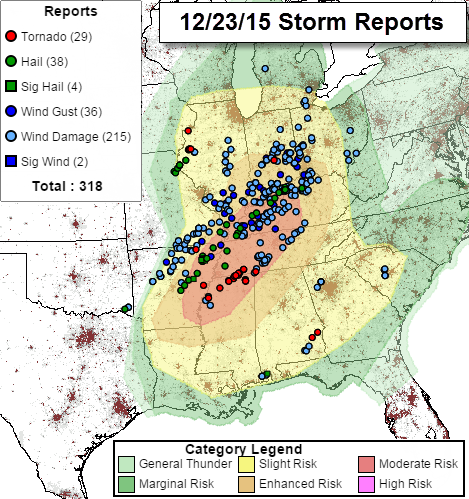 An outbreak of severe thunderstorms swept through areas from the Midwest and Ohio Valley into the Mid-South on Wednesday afternoon and evening, bringing high wind, large hail, and at least one long track tornado. 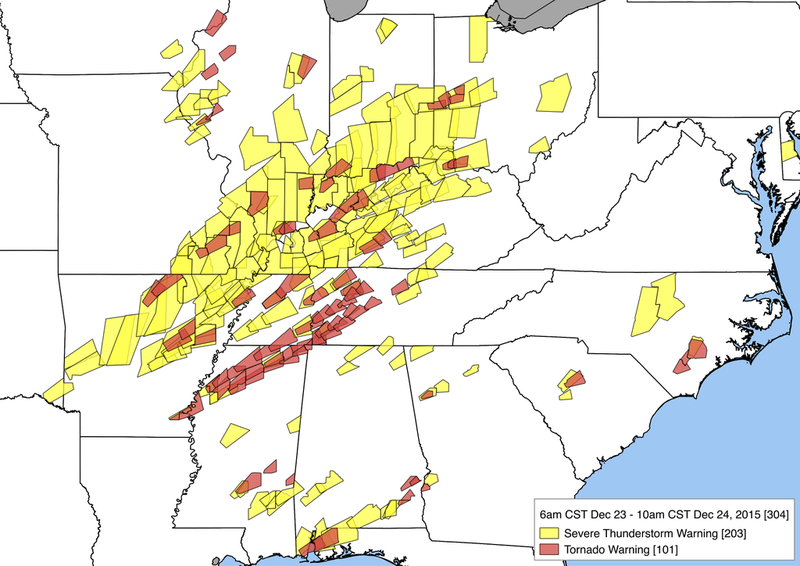 The north Mississippi supercell that dropped a tornado near Clarksdale, MS continued east-northeast at near highway speeds as it tore through places like Como, Holly Springs, and Ashland. Preliminarily, the NWS in Memphis has assigned an EF-3 rating to the twister that at times was up to 3/4 mile wide, though a full assessment of the nearly 150 mile path will take days. The forecast from the Storm Prediction Center and local NWS offices, and relayed through media partners and private enterprises like MWN, was overall very good. See the mid-day SPC risk area below with preliminary storm reports below. The Enhanced Risk area in particular matched up well with where severe weather actually occurred, while the Moderate Risk and "Particularly Dangerous Situation" Tornado Watch correctly captured the north Mississippi beast. The warnings issued by the local NWS office also were spot on and correctly highlighted the threats that were imminent or ongoing, including the use of the rare "Tornado Emergency" Warning for Holly Springs, well before the tornado devastated southern portions of the town. The cumulative warning map below shows just how widespread the threat was. Fortunately, most of the metro outside of Holly Springs, was spared nature's wrath, despite some reports of up to quarter size hail in Bartlett and strong wind gusts as the storms moved through. We were fortunate indeed! 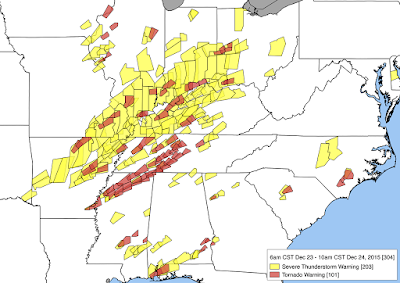 NWS Severe Thunderstorm (yellow) and Tornado (red) warnings issued on December 23, 2015. So now we get a break for a while right? 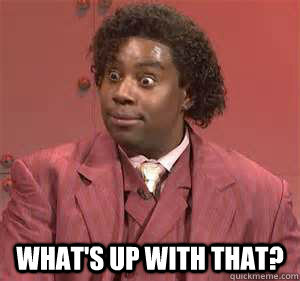 Well... from high threat severe weather, yes, but from lower-end strong storms and rainfall, no. As you have noticed, it doesn't feel like Christmas Eve outside, despite a cold front moving through yesterday. 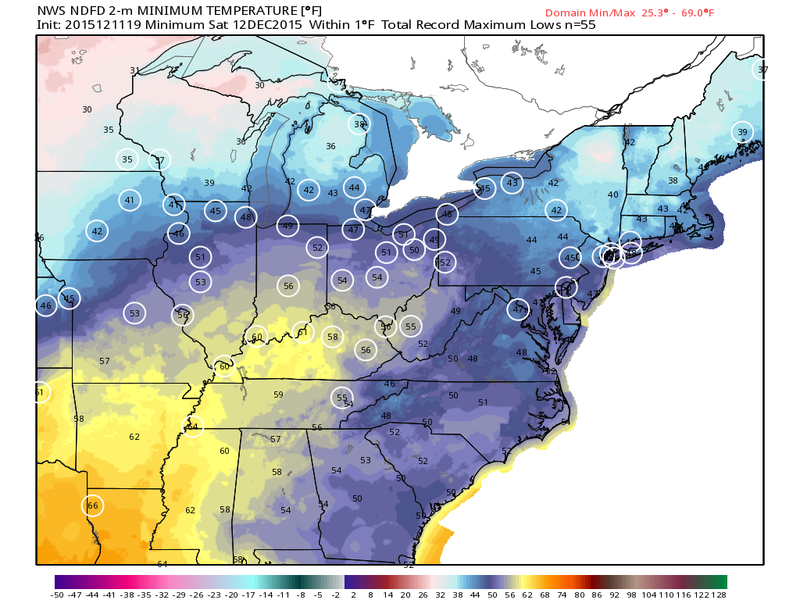 The overall upper air pattern has changed very little and near-record warmth continues. Despite a very pleasant spring (err, winter) day today, clouds and rain move back in tonight as yesterday's front turns back north as a warm front and puts us right back in the warm sector for the weekend. As it slowly meanders through the area tonight and tomorrow, rain chances return and thunderstorm chances also appear high, starting after midnight tonight and continuing off and on through Christmas Day. 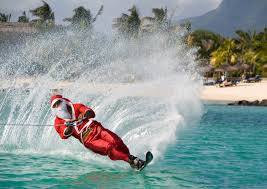 Unless Santa arrives before midnight tonight, he's going to need rain gear and a lightning rod on his sleigh! Rudolph's nose might come in handy tonight. 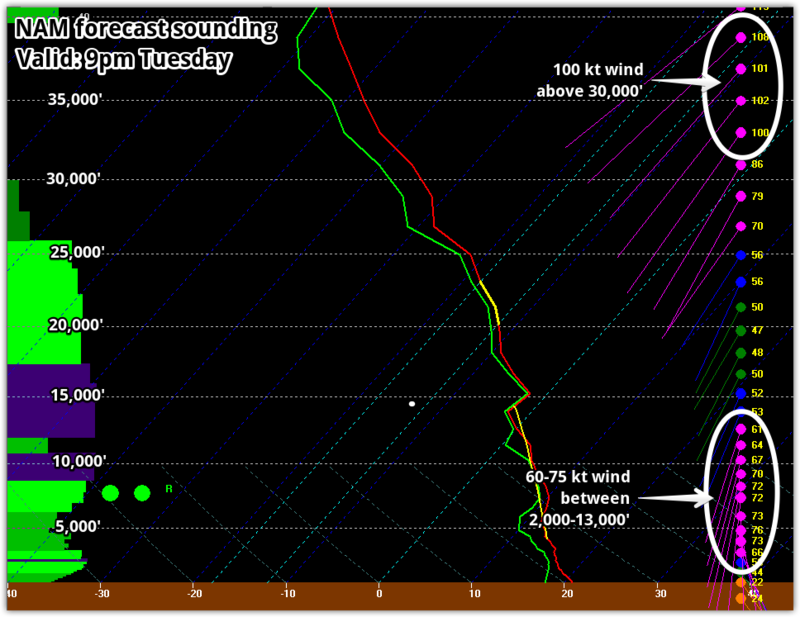 The chance of severe weather with tonight's storms is low, but not zero. SPC has a Marginal Risk (category 1 of 5) over the metro, mainly for a few strong wind gusts or some hail. 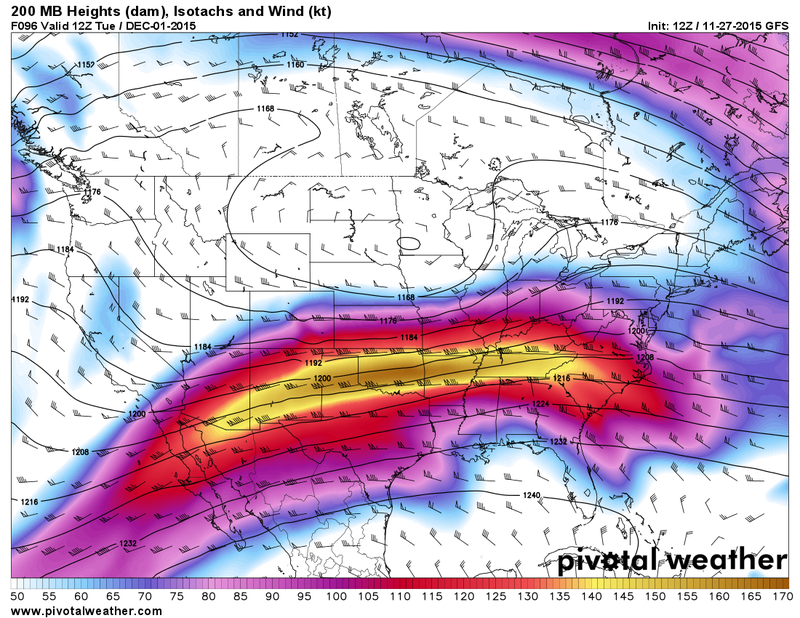 However, along the front, there is a fair amount of "atmospheric spin," which COULD result in a weak tornado. However, this threat is nowhere close to yesterday's. 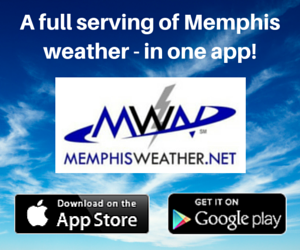 We think you should go to sleep tonight dreaming of a White Christmas and just have the weather radio or StormWatch+ in your MemphisWeather.net app on, just in case. We don't think you'll need it. The SPC severe weather outlook for tonight shows a low-end risk of severe weather, mainly after midnight. 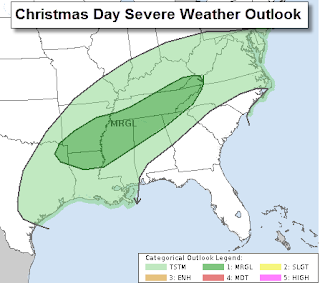 On Christmas Day, storms will remain possible along the corridor marked by the frontal boundary. Once again, a Marginal Risk of severe weather is indicated by SPC, as shown below. The main threats remain a stray damaging wind or hail report, with a very small risk of a weak tornado during the morning or afternoon. Again, remain aware but don't change any plans, other than making sure your plans are all indoors, despite the warm weather! 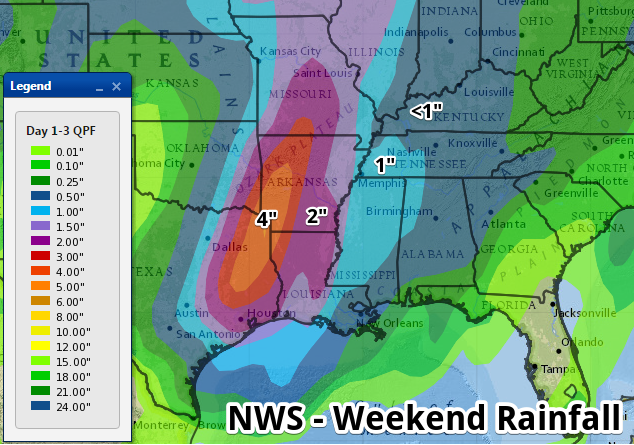 Rainfall on Christmas Day could reach an inch, especially in north MS.
As we become firmly entrenched in tropical Gulf of Mexico air Saturday, record highs in the mid 70s will be threatened and the rain threat shifts north of the metro, outside of a stray shower or three. It'll feel like April. 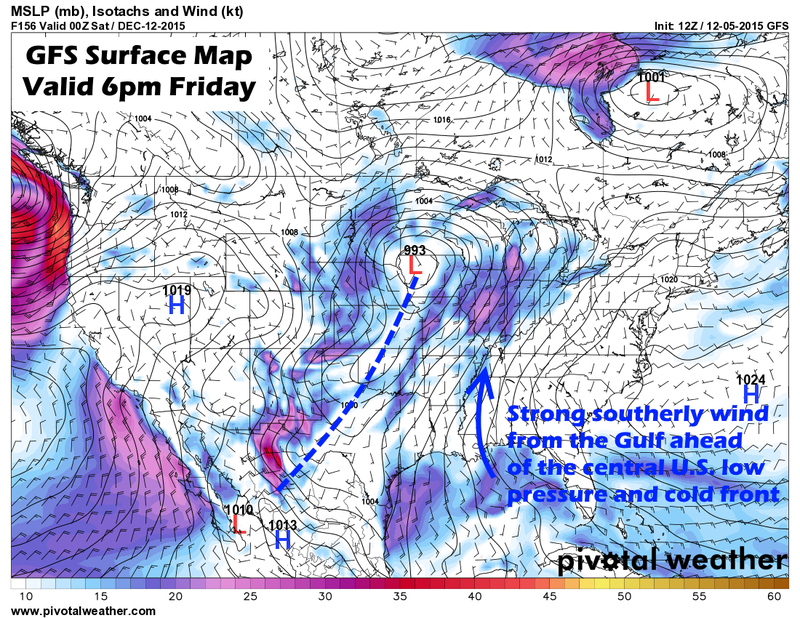 On Sunday, the front moves back into the area as low pressure forms over the Southern Plains. This will mean increased rain and thunderstorm chances. 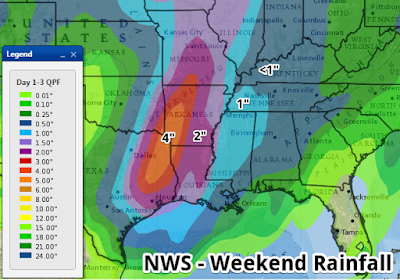 Then as the low, or its attendant cold front, move through the region sometime between Sunday night and Monday night, we continue with high rain chances, but with temperatures falling a bit (but still above normal). Severe weather during this period is still a question mark. The more definite scenario is a LOT of rain. The NWS says as much as 4-5" is possible in some areas between now and Tuesday morning with much of it falling Sunday and Monday. 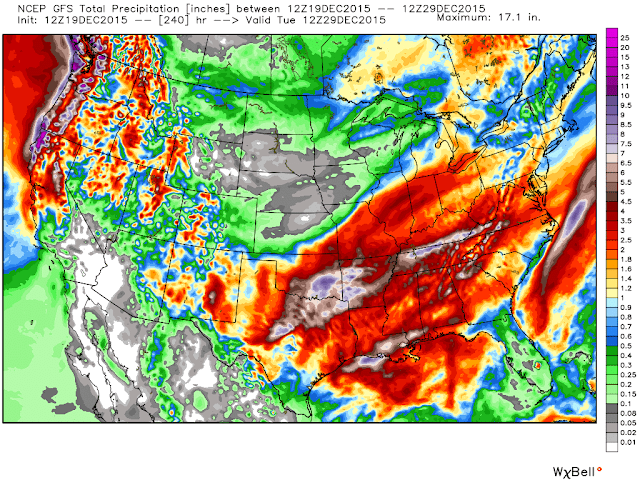 Flash Flood Watches appear likely for that period. 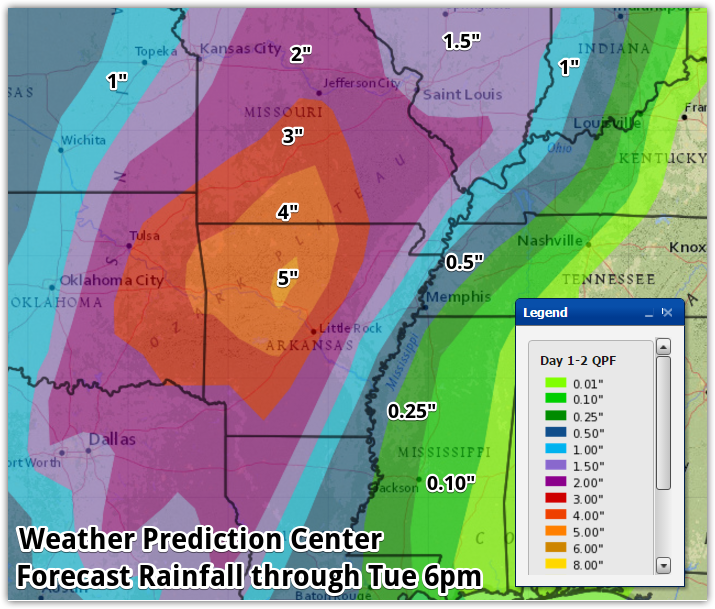 Total precipitation forecast by the NWS through Tuesday morning. 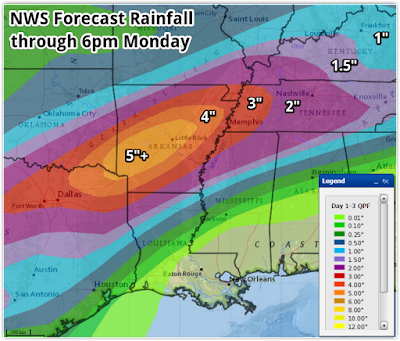 The Mid-South is in an area that could receive up to 5" of rain while even higher totals are expected to our north and west, where flooding is nearly certain. 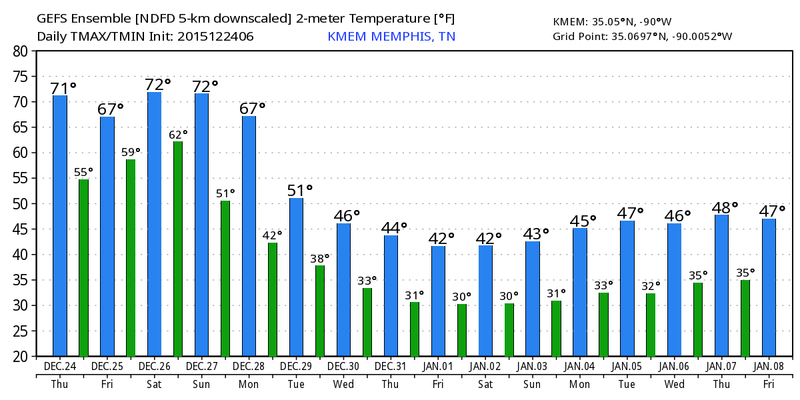 Behind that system, it appears we finally get to experience more seasonal temperatures as the pattern flips heading into the New Year. 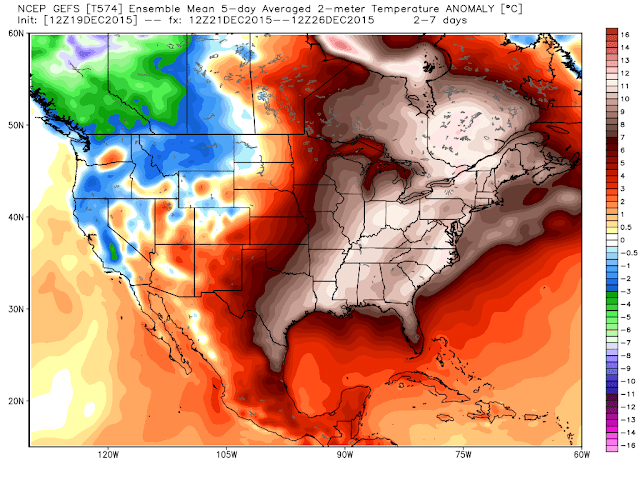 For trend purposes only, check out the GFS forecast temperatures for the next two weeks. It looks more like January as January arrives! GFS model forecast temps for the next two weeks. Use for trend purposes only (numbers are not exactly right). Winter is coming! Here's the latest on tomorrow's severe weather potential as of 7:30pm Tuesday night. Take 11 minutes to watch and get all the information you need to prepare, then another 10-15 minutes to take those preparation steps tonight. 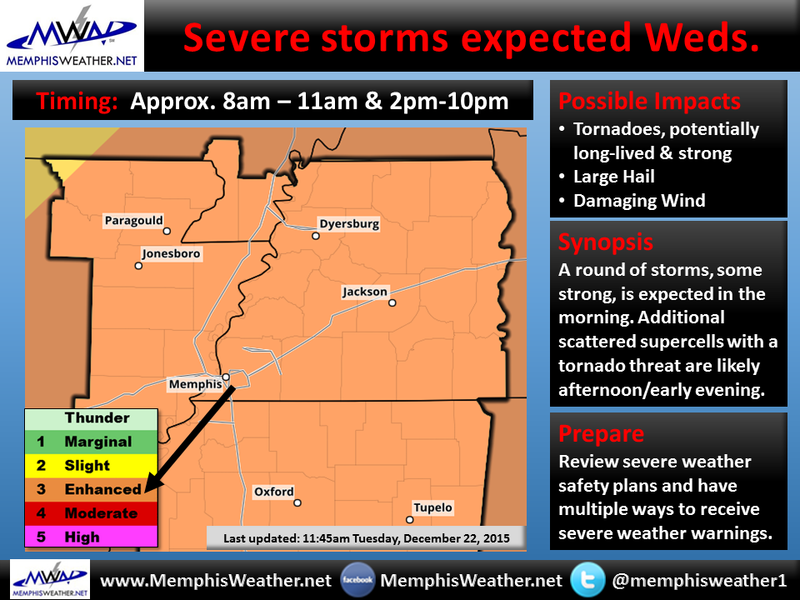 Severe weather is LIKELY tomorrow. As mentioned in the video, be sure to check out StormWatch+ in the MemphisWeather.net mobile apps for iOS and Android. For $7.99 (plus $0.99 for the base app), you get a portable, customizable, PRECISION severe weather alert notification system. Think of it like a 2015 version of a weather radio that only alerts you if you need to be alerted! Link for more information and to download is below. We'll have more updates starting early Wednesday on Twitter and Facebook. MemphisWeather.net meteorologist Erik Proseus takes a look at your Christmas week forecast, including a travel outlook for those leaving the area this week to visit family and friends. 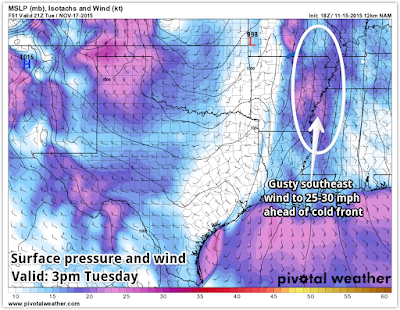 An in-depth examination of the meteorology behind our severe weather threat on Wednesday is also discussed for you weather nerds. If you just want to know what to expect this week from a forecast perspective, fast forward to the 21:00 mark! We advise you to have multiple ways of getting severe weather information on Wednesday, including NOAA Weather Radio, local TV/radio, and a smartphone warning app. 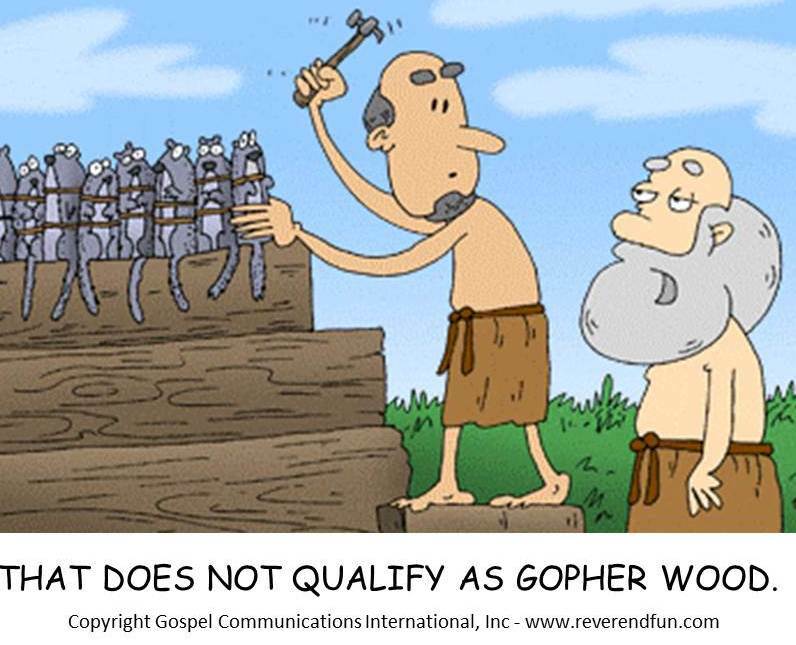 We recommend our own app, of course! MemphisWeather.net for iPhone and Android includes an optional push notification warning service called StormWatch+. For $7.99 one-time, you get a fully-customizable mobile weather radio that alerts you only if you are in the path of a storm, not if your county is. Get more information and download the app at the link provided below. 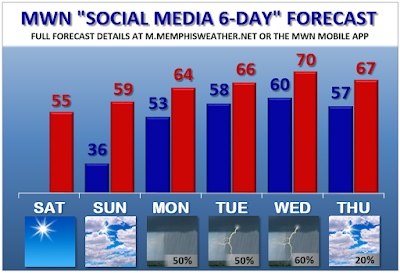 Stay with MWN on Facebook and Twitter for updates as warranted throughout the week. Have a safe and happy Christmas week! Temperature anomalies from Dec 21-26 from the GEFS model ensemble indicating well above normal temperatures for the eastern U.S./Canada during Christmas week. 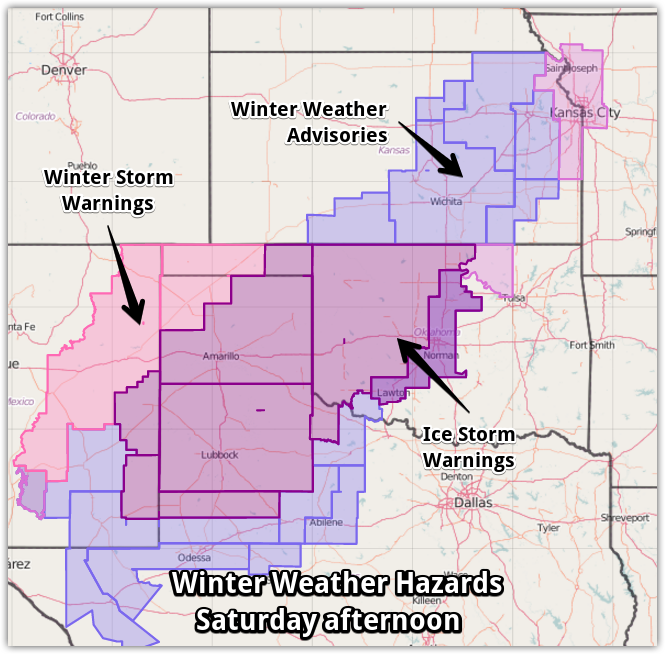 Graphic courtesy WxBell. That's why we won't be seeing anything close to a white Christmas. But it doesn't mean we'll be dry. In fact, the American GFS model predicts precipitation for the next 10 days looks like the next figure - 4-5" of rain through the morning of December 29th. Honestly, for some areas of the Mid-South that could be a little low looking at other long-range model solutions. 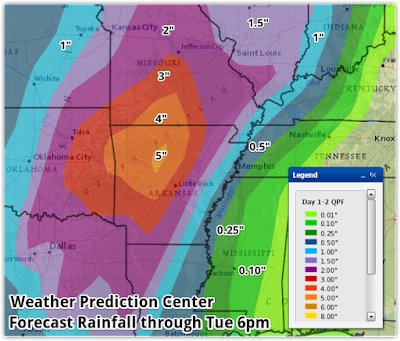 Total precipitation forecast by the GFS model through Tuesday morning, December 29. 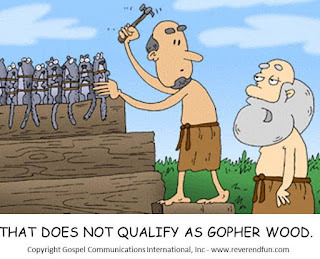 Graphic courtesy WxBell. With excessive warm air and lots of moisture in place, as well as passing low pressure systems, we will also be in for some thunderstorms. 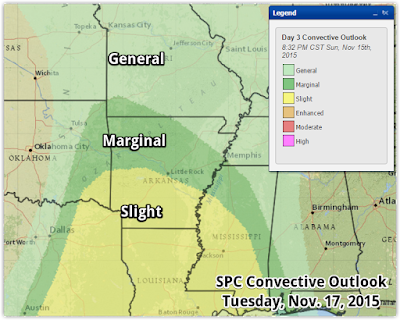 The chance for severe weather is still questionable, but we'll be keeping an eye on it. Possibly the best chance is Wednesday as low pressure and a cold front affect the region and temperatures reach near 70° but it is too soon to tell. It does appear that we may get a relative "break" from the rain behind that Wednesday system which could mean a drier Christmas eve. Instead of hot chocolate, we could be saying "pass the sweet tea" on Christmas morning. Stay tuned for additional detail the next few days. Warm December weather continued into early this week, despite a cold front over the weekend. 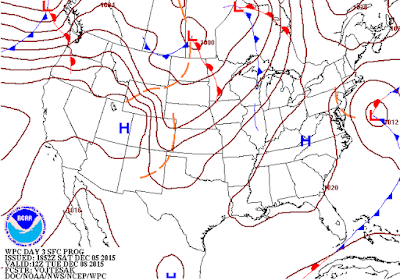 High pressure behind that front was Pacific in origin, so it didn't bring a great deal of cold air. 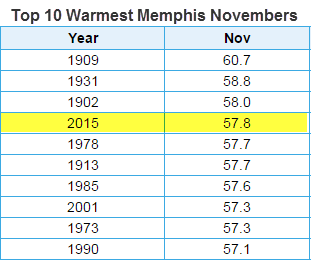 Hence we stayed in the 60s for highs (actually 70° officially yesterday). Today, another cold front moves through and this one will bring some more December-like air with it. Ahead of the front, showers and even a few strokes of lightning occurred and moved over the metro this morning. Expect to see a chance of showers continue this afternoon until the front passes by rush hour. The strongest storms with this system will be closer to the Gulf of Mexico today. 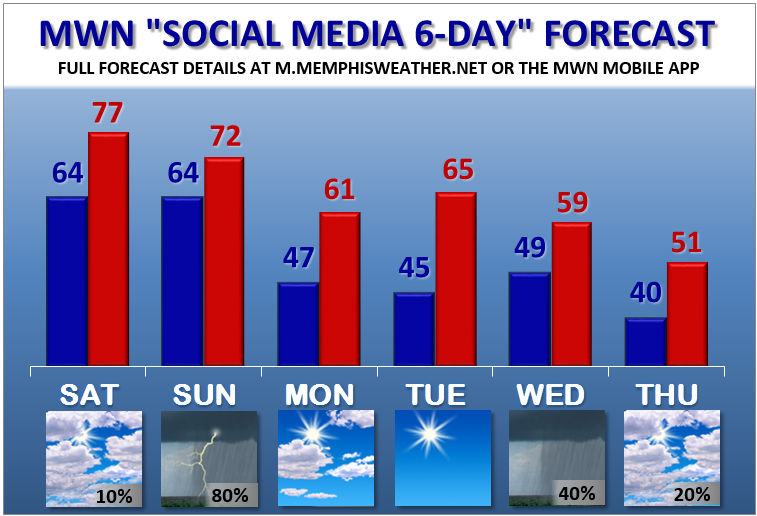 Behind today's front, our 60°+ highs will be gone for several days. 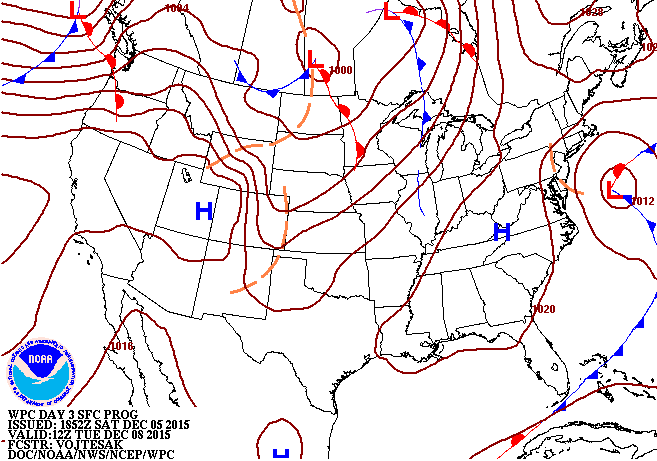 In fact, the high pressure system that builds into the region will have some pretty decent cold air with it. Thursday will be a transition day with seasonal temperatures (highs in the lower 50s and lows in the upper 30s), then we drop below normal Friday with highs in the mid 40s and much of the area dropping below freezing (see surface map below showing the large dome of cool high pressure over the southern U.S.). 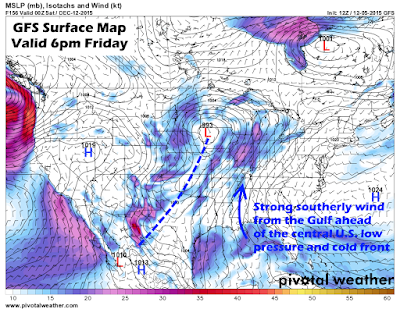 The surface forecast map for Friday morning shows cool high pressure moving across the southern plains, resulting in weather we are more accustomed to in December. But it will be short-lived as the high moves east and the Mid-South gets back into southerly flow by late in the weekend. As we head into the weekend though, that high moves to our east and starts funneling warm air into the region again on southerly wind from the Gulf of Mexico. An "average" day on Saturday transitions us to above normal once again as we head into Christmas week. Clouds increase Sunday with rain chances looking decent for Monday as high temperatures rebound back into the 60s, a good 10° above normal. 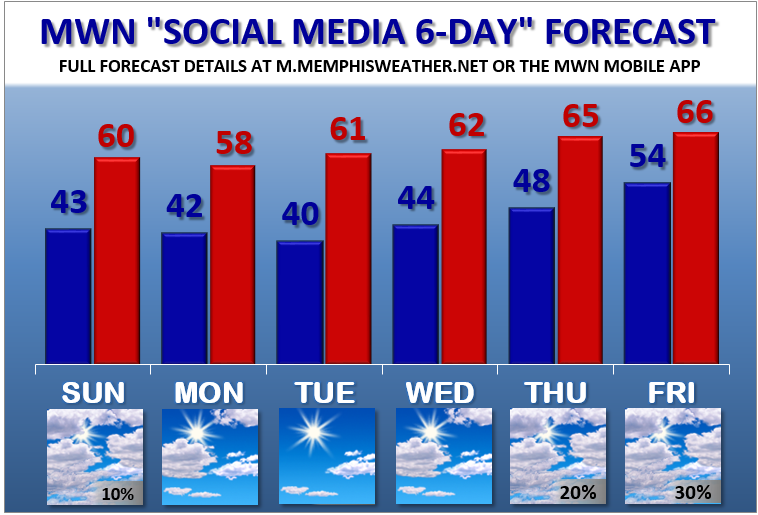 The MWN Forecast below outlines the next 6 days for you. Christmas week will bear watching closely. Not only will we be back into a very un-Christmas-like pattern with warm, moist air on strong south wind, but disturbances in the force (obligatory Star Wars reference) will result in rounds of showers and thunderstorms through at least Wednesday (into Christmas Day if you believe some fairly reliable models). In fact, there is some support for potential severe weather and temperatures back near 70° Tuesday and Wednesday of next week. It's too early to define specific or timing, but the signals are definitely strong for a very warm and wet few days leading up to Christmas. Below are and temperature and precipitation probability forecasts from the NWS Climate Prediction Center for the period December 21-25, indicating a 60% chance of above normal precipitation and a 90% chance (as definite as it gets) of above normal temperatures for a large section of the eastern U.S. The best chance for a White Christmas is unfortunately going to be a plane ride away in the higher elevations of the western U.S. it appears. Not only is grit and grind dead, but so is any lingering hope of a White Christmas in Memphis. NWS Climate Prediction Center (CPC) temperature outlook for Dec. 21-25 showing a 90% chance of above normal temperatures for the eastern half of the U.S. As close to a sure bet as it comes. The NWS CPC also indicates a high likelihood of above average precipitation. Combined with the warm temperatures, we'll be watching for the chance of thunderstorms during Christmas week. Is it still December? The weather is acting more like April! 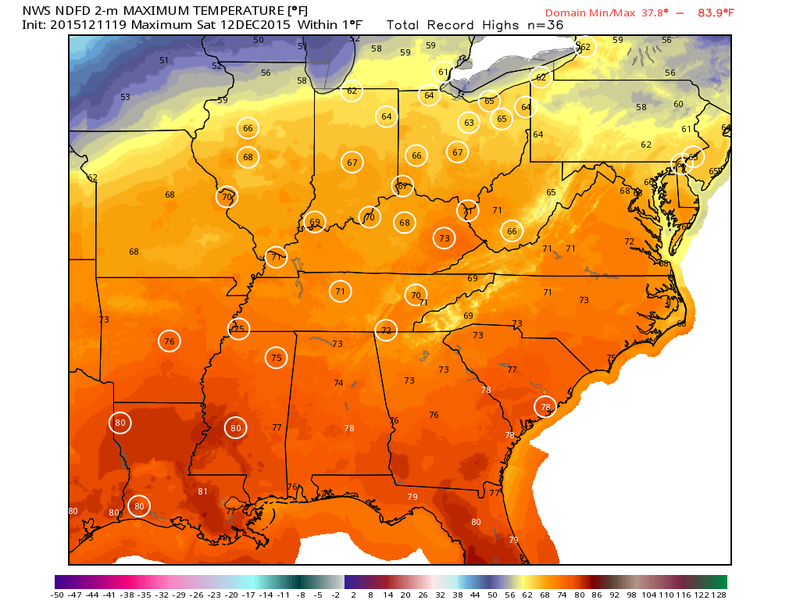 Very warm air is in place across much of the eastern half of the nation in a season known more for snowflakes up north and cool breezes down south than shorts and t-shirts! Today's high (as of 3pm) of 77° ties the record for the date set in 2007, and we aren't done with record warmth! With another couple of days of warmth ahead, that must mean the frontal system will be a doozy huh? Well, maybe not... at least as far as severe weather. 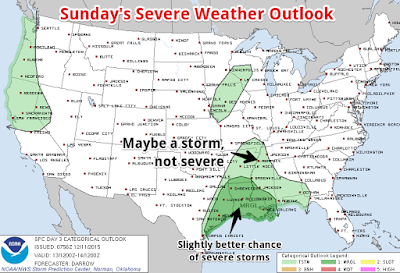 The Storm Prediction Center's outlook for Sunday (below) shows the most likely chance of severe weather well to our south, along the western and central Gulf Coastal region into eastern TX and Louisiana. The light green area (which includes the metro) basically means that thunder is possible but severe weather is not anticipated. 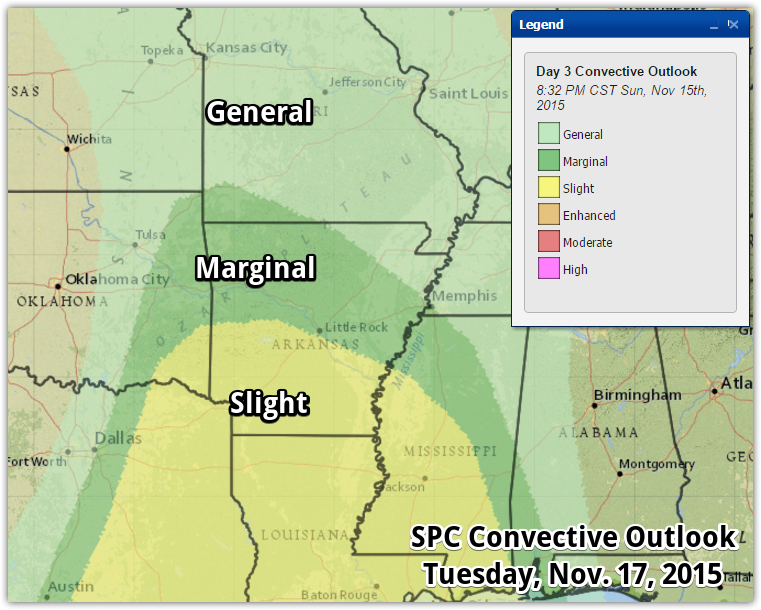 SPC severe weather outlook for Sunday. The best chance of severe storms will be well to our south, though a rumble of thunder will be possible with the PM rain. We think that this situation will need to be monitored fairly closely, so we'll do that. With temperatures already running above what computer models thought we'd see, and a pre-frontal trough (basically a weak front ahead of the main cold front) moving through near or just after peak heating on Sunday (late afternoon to early evening), we could end up with a little more unstable environment than the models currently depict. Until this morning, the SPC risk zone also stretched a little further north, up to the MS/TN state line. So it bears watching. Like our triplicate systems in November, this one will again have plenty of wind energy but is lacking in instability. Stay tuned. As far as precipitation, a pretty healthy amount of water will be falling from the sky Sunday late afternoon through evening. We agree with this NWS map below (which agrees with computer models) that a good inch is likely and some places could see up to 2" is multiple downpours move overhead. 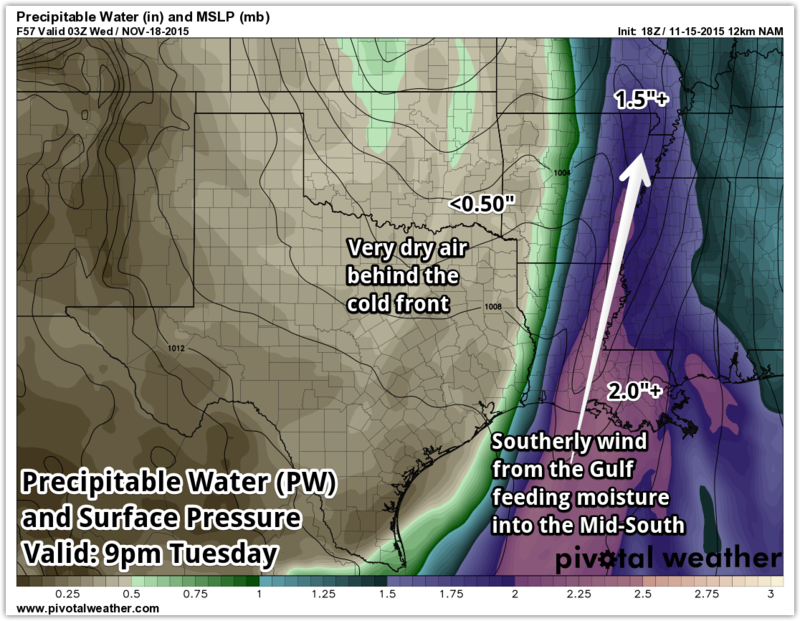 Precipitable water (which measures the amount of moisture in a column of air over a point) will be nearly 1.5", which is near record highs as well (similar to a couple of those wet November events). 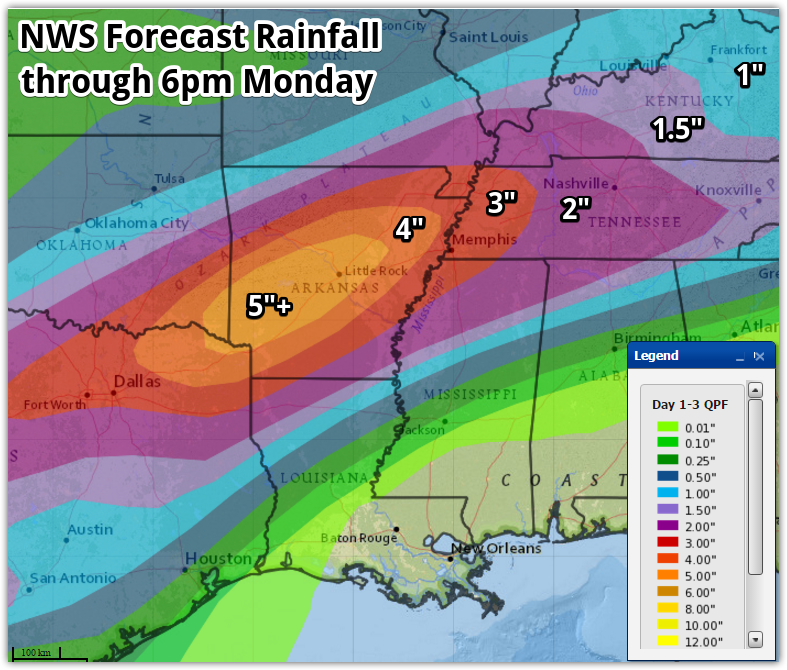 Forecast rainfall amounts through Monday, according to the NWS. The other factor on Sunday in particular will be wind ahead of the weather system. We encourage you to tie down anything outside that you don't want blowing a few blocks to your north. 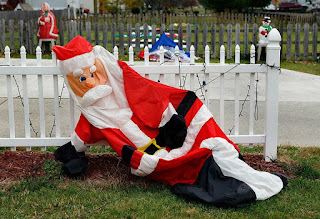 Deflate the blow up Christmas decorations unless you want to show the kids how reindeer really do fly. Behind Sunday's system, it'll be a bit cooler, but still well above normal temperature-wise. 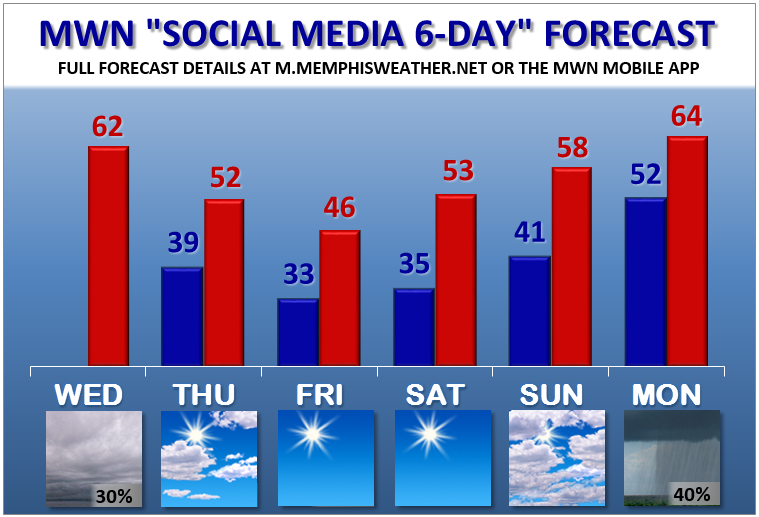 A mid-week system brings another chance of rain (much lower chances and less precip) but finally pushes temperatures back down to near normal (lower 50s for high, mid 30s for lows) to end the week. Be sure to follow our Facebook and Twitter accounts listed below for the latest details on this weekend's weather and use the opportunity provided by warm weather to (finally) get those Christmas decorations up. Just be wary of the wind! Spectacular weather for the first weekend in December, which is always a busy one! 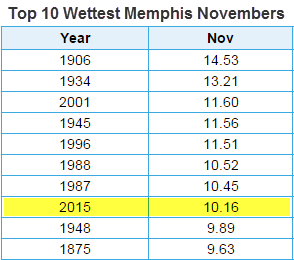 The Memphis Marathon couldn't really have asked for finer conditions (remember the ice storm a couple years ago?) with chilly temps early that warmed quickly and light wind. Christmas Parades abound today as highs reach the lower 60s with sunny skies. Normal highs are in the mid 50s with lows in the mid 30s this time of year. 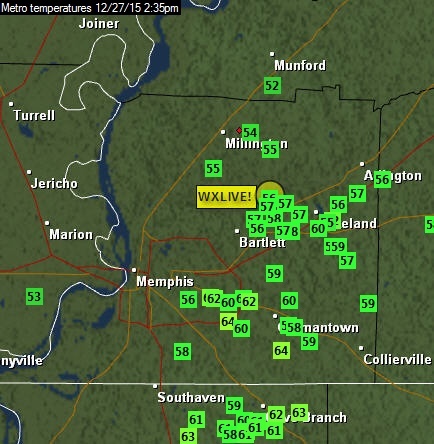 Current metro temperatures from MemphisWeather.net. Above average temperatures will continue for the foreseeable future as upper level ridging dominates the region (with a few quick passes of transient upper level disturbances) and high pressure at the surface resides over the eastern U.S. We'll likely get used to afternoon temperatures in the 60°+ range over the next week! 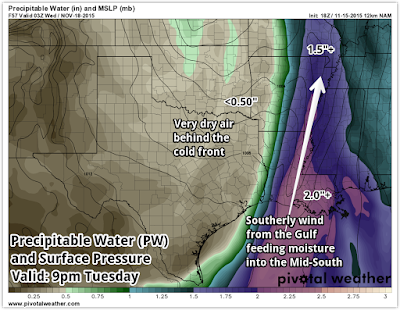 The first upper level "imperfection," and its weak surface cold front pass, by tomorrow, bringing cloud cover and maybe a few sprinkles, but a very small chance of measurable rainfall. Despite the cloud cover, temperatures should still reach 60°. 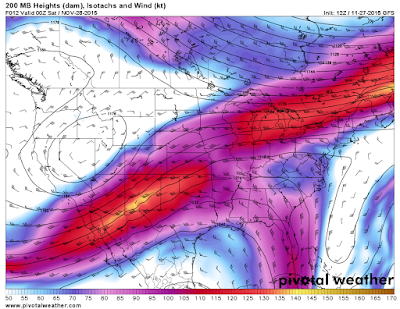 Upper level (500mb, or 18,000') loop showing an approaching trough and disturbance (red to purple colors) moving across the south-central U.S. through noon tomorrow. 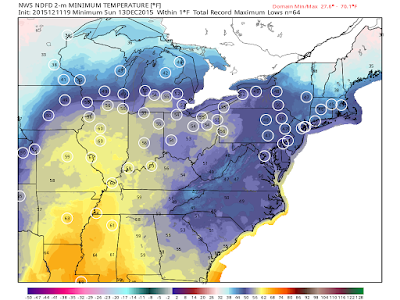 Graphic courtesy PivotalWeather.com. Rapid Refresh model. By Monday, the passing trough is replaced by another ridge of high pressure as the sun returns and temperatures climb into the upper 50s. Tuesday and Wednesday features more of the same with slightly warmer weather. Highs return to 60° or a bit higher each day. By 6am Tuesday, high pressure covers most of the central and eastern U.S. leading to tranquil weather and above average temperatures for the Mid-South. 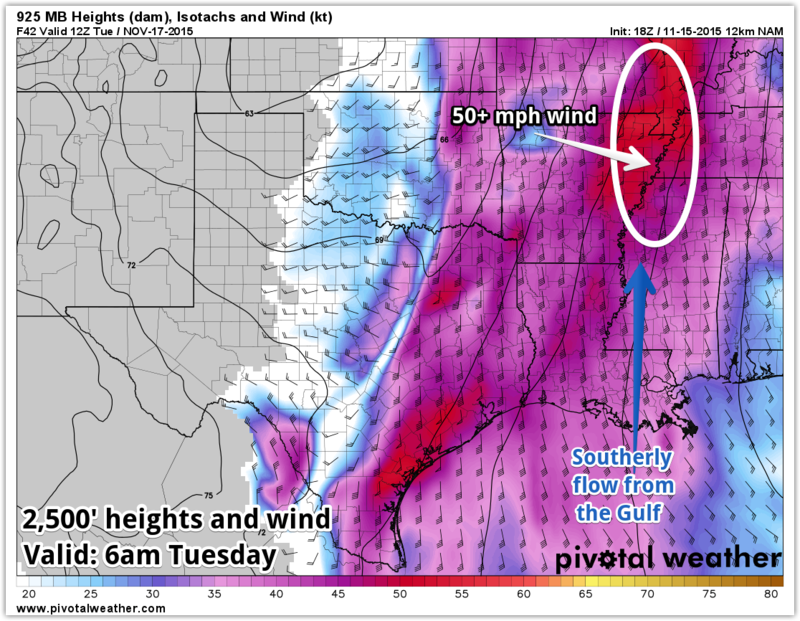 With the high to our east, wind becomes southerly on Tuesday. Graphic courtesy NOAA. As we head into the latter half of the week and next weekend, strong southerly flow (marked by moderate south wind and moisture feeding into the region from the Gulf of Mexico) establishes itself over the southern U.S. This pattern means a couple things: more clouds and periodic rain chances, but also even warmer temperatures. Towards the end of the week, strong southerly wind pushes temperatures up but also means periodic rain chances. The GFS model depicts this pattern well for Friday night. 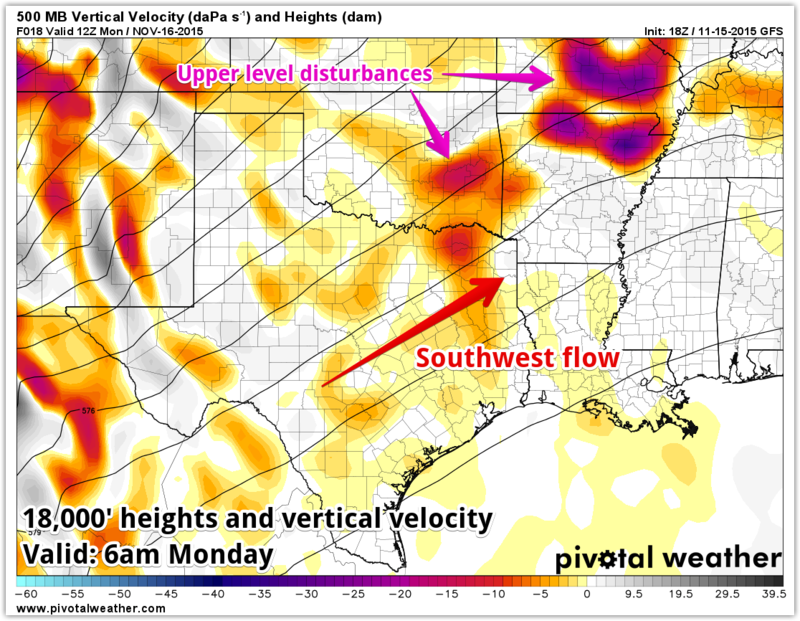 Graphic courtesy Pivotal Weather. The Climate Prediction Center temperature outlook for the third week in December shows a 60-70% chance of continued above normal temperatures for the metro. In fact, most of the nation east of the Rockies could experience above normal temperatures, on average, from December 13-19.